We are always willing to think outside of the box. We don’t take the “old salt” logic at face value and we tend to do a lot of research to make our own opinions. When it came to how we plan to manage our dinghy we were open to look at any and all options. That being said, we purchased our Highfield inflatable due to its light weight, which we knew would give us many options for transporting as we cruise. But once we had the dinghy there were so many other questions to consider: how to transport the dinghy? How to mitigate theft? Are we going to keep it in the water at the dock and have to pull it out all the time to clean the bottom or is there another option? Some of the answers seemed easy enough; but other questions/concerns – not so easy. Initially we were thinking that we would add traditional dinghy davits. The primary issue for us is that we really like our walk-through transom and having davits would limit that aspect of the boat. Also, climbing from the dinghy with the davit lifting lines connected would become a problem with our ladder. 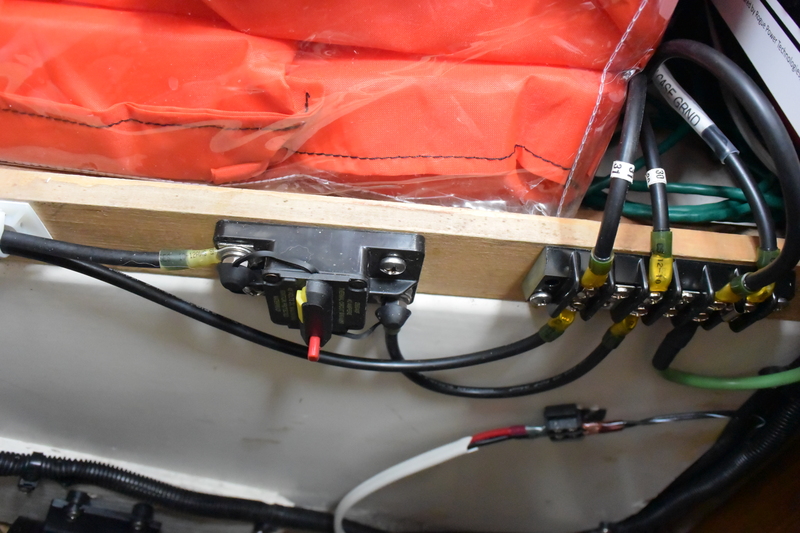 But the biggest issue is that having an additional 100 – 175 pounds counter-levered off of the back of our 31 foot boat will seriously impact the performance of the boat. So traditional davits have been ruled out for us. For longer passages in open water, we can put the dinghy on the bow. Obviously this is not an easy process, as we have to empty out the dinghy entirely and remove the engine. In our opinion, this is really the safest way to carry the dinghy when heading offshore. But on shorter trips, especially as we hop down the East Coast and go into a new harbor or secluded anchorage each night, what are our dinghy travel and security options really? We have found that on very short trips, in more protected waters it is easy enough to tow the dinghy. We have a 20 foot painter that is setup with a bridle for towing. This works but has some draw backs. For instance, how do we secure the dinghy at night? In our current situation it’s not a major issue. But as we go further south, dinghy theft becomes an issue. 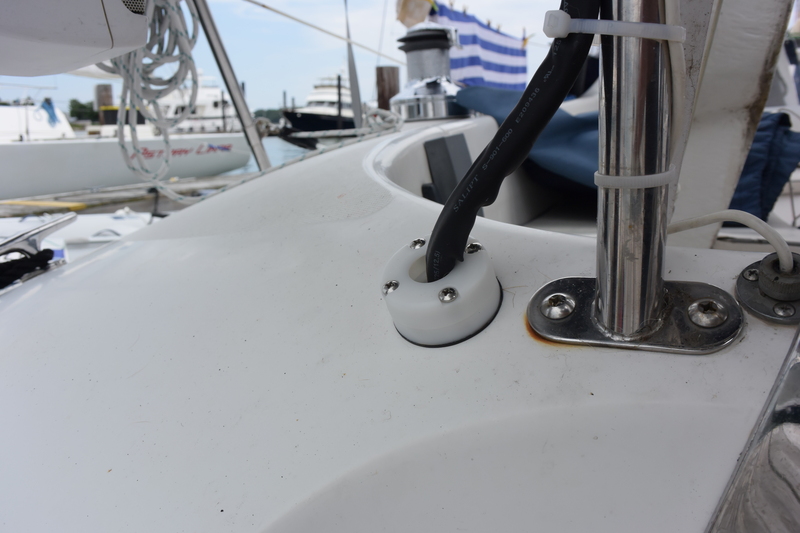 We can lock the dinghy at the stern while at anchor but, ideally, the best way to protect the dinghy from theft and growth is to get it out of the water. 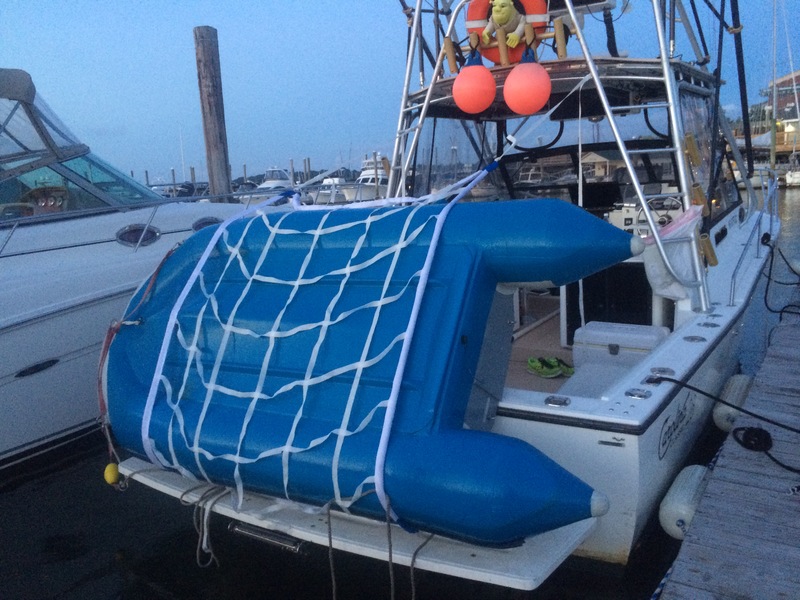 While doing a little internet research on the subject we came across the Dinghy Sling System by Harbormen Marine. We were quite excited to find this – what a great easy option keep the dinghy out of the water at night and while traveling! We had to know more about this product. The cool thing is that this company is located in Hingham, MA, less than two miles from our marina. I met up with Dave, the owner, to talk about using the Dinghy Sling on our Catalina. Dave is a great guy and is making the dinghy slings with his college-age son. He walked me through how he sources the materials, the improvements he has made to the sling along the way. We spoke extensively about the strength of the system. At first glance I was skeptical about the plastic clips used in the system. But after Dave explained the research he did in sourcing materials and that the rated strength of the clips is 200 pounds, I became more confident in the sling. Dave lent me a sling to try on our Catalina. To setup the system, you start by floating the sling behind your boat with one side attached to your stern. You then pull the dingy over the sling and attach the dingy to the sling on the boat side with the straps provided. Long straps are attached to the far side of the sling and you use those to pull the dinghy vertical. 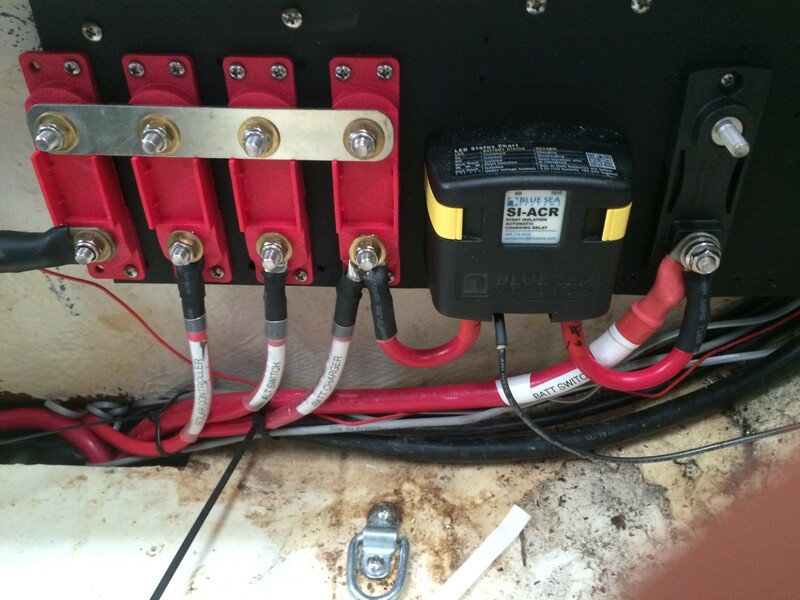 The straps can be attached to cleats or other fixed points on your boat. You deploy the dinghy by doing the same in reverse. The cool thing is that once you drop the dinghy to the water it is still attached to the boat. You can climb in, put on your engine and then release your dinghy and float away from the sling. We tried the sling prior to our trip to Provincetown. Our first attempt didn’t go so well. To bring the dinghy vertical was tough. I had read that this was an issue with Snap Davits and similar products. I could get my side up but my Bride was struggling to hold the weight while we tried to secure it. So we stayed with the towing plan for that trip. I was telling a friend at the dock about the Dinghy Sling and he was interested in it for his boat. We tried it out on his boat. The result this time was much better. I think having an actual swim platform was a big difference. It gave a good pivot point that allowed the dinghy to be lifted a little easier. In fact, once we got the hang of it, one person could lift the boat easily. The dinghy sling system is great. It secured the dinghy to the boat without having to make any permanent changes to the boat. Best of all, with the dinghy vertical and not counter-levered over the stern it didn’t affect the performance of the boat as much as towing. 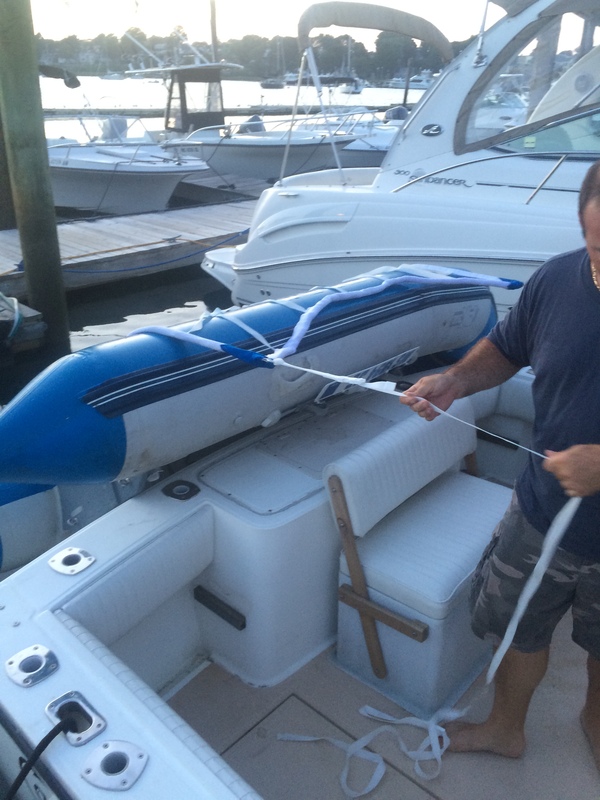 The dinghy sling seems to be a great alternative to installing davits of any kind permanently on your boat. You don’t have to drill or glue anything onto your boat or dinghy. And at only $245 it’s a fraction of the cost of other systems. It can get the dinghy out of the water to help prevent growth and mitigate theft. And when you aren’t using it, it stows in a small backpack out of the way. Categories: Equipment/Products Reviews, Upgrades & Repairs | Permalink. We have fallen into a routine that on Saturdays we go to my office and work on various boat projects and on Sundays we study for our captains licenses and work on smaller projects on the boat. All part of trying to get that Epic To-Do List gone. So today’s task was for me to drive our Highfields RIB to Portsmouth, RI to drop it off for the dealer to fix a leak at one of the valves. If you have read our We Bought a Boat at the Boat Show or review of our Highfields CL290 Aluminum RIB you know we went a little deep into the cruising kitty for this purchase but are very satisfied with the dinghy. Late last year I notice it seemed to be losing air on the port side. This was in October so I thought it was mostly related to the cold weather. Over the winter I am lucky enough to store the inflatable in our heated warehouse at work. I noticed it seemed to lose air in the warehouse too. So I did the typical check with soapy water and found that we were losing air around portside valve. I figured this was a warranty repair but I expected it would take a while to get it back because the dealer is probably busy with getting ready for Spring. So this morning I packed up one of the work trucks with the RIB and drove the hour and a half or so to Maritime Solutions/Inflatable Experts. When I got there Norm, whom we had dealt with when we purchased the boat, so me coming and knew why I was there. He had a couple of the guys from the shop come out and unload our RIB. I explained the loss of air and that I thought it was coming from the valve. They pumped it out and checked it with a soap like I had and found the same valve leak. They explained to me that the valve systems were screwed together to compress the fabric between and inner and outer section. 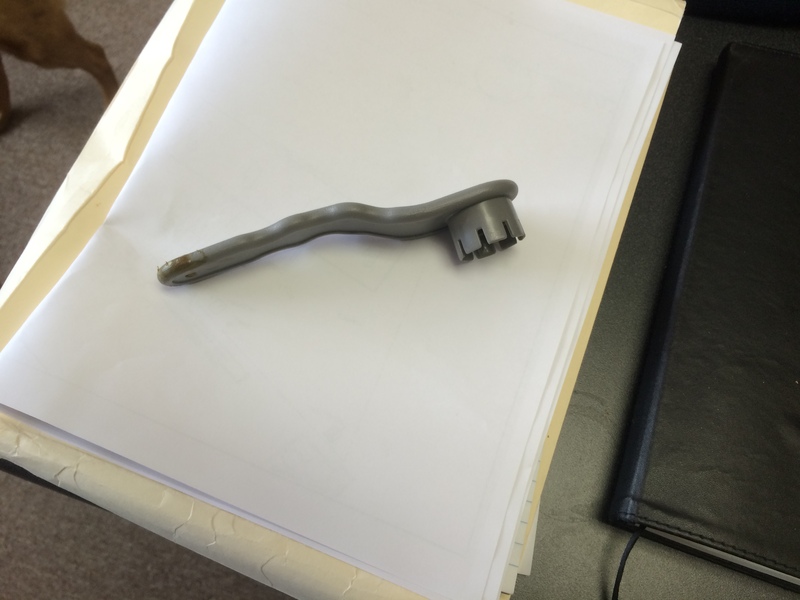 They got the specialty plastic wrench and tightened up all the valves. When I told them they we were going cruising to the Caribbean one of the guys in the shop went and got me an extra valve wrench that he had. He didn’t want me to lose any fun days out cruising to get such a simple repair done. They put the dinghy back into my work truck and helped me strap it down. I was there for about 45 minutes and left with a fixed dinghy. 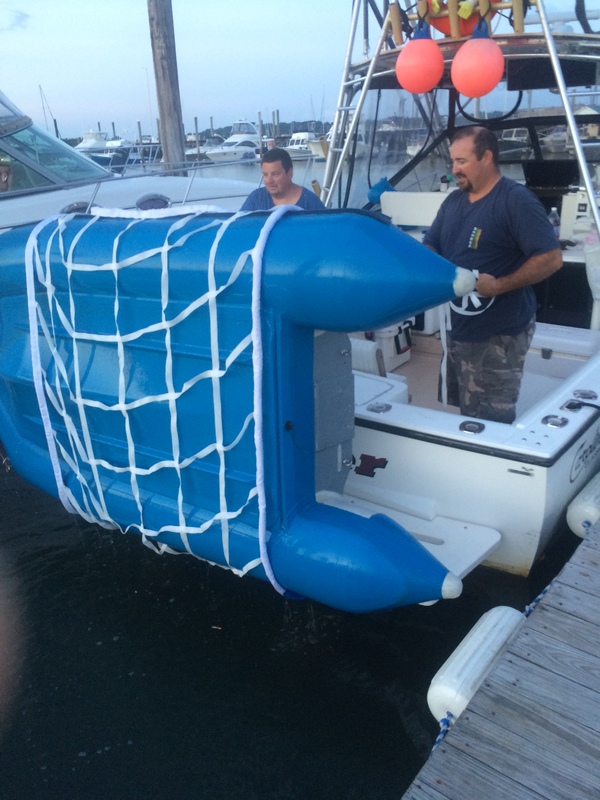 The guys are Maritime Solutions/Inflatable Experts are great and I would recommend them to anyone without hesitation. Categories: Equipment/Products Reviews, Inflatable & Outboard | Permalink. I posted a back in February that we bought a new inflatable. Our new inflatable is a Highfields Classic 290 rigid aluminum hull with ORCA hypalon tubes. 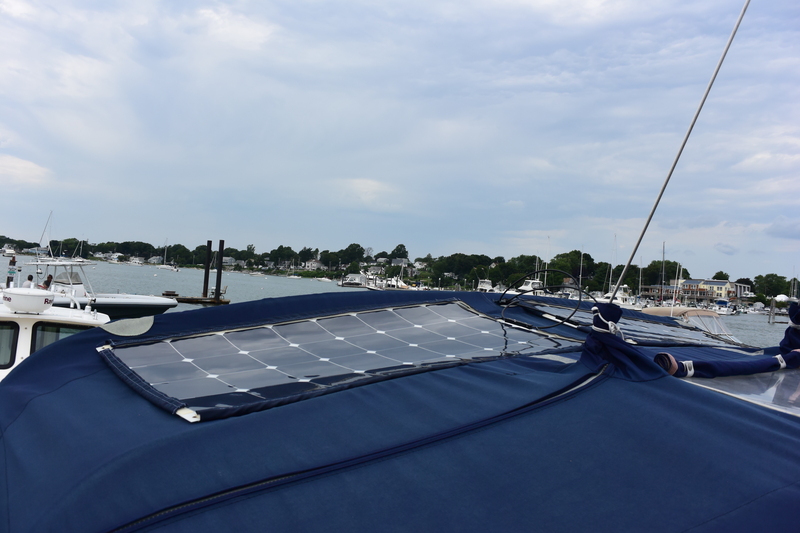 We purchased the boat from Maritime Solutions/InflatableXperts in Portsmouth, Rhode Island. I had spent a fair amount of time researching inflatables and local dealers and found the Highfields and this dealer to be a good value with a good reputation. We purchased in February and Maritime Solutions said they would hold the boat for us free of charge until we were ready to pick it up. In early May I gave them a call and said we would like to come and pick up the boat. They said no problem and asked if we wanted it created or blown up for inspection. I liked that they gave me the choice and asked ahead of time. If we had gotten there and it was still created and we had to wait around while they uncreated it and blew it up that would have been a pain. I asked them to blow it up and they said no problem. We drove down there in a borrowed pickup on a Saturday morning. When we got there the boat was inflated. They let me inspect it for as long as I wanted and helped us load it and tie it down. Norm, the salesman we had purchased the boat from, was there and went over the paperwork with us. He was very knowledgeable about Massachusetts laws and how to register the boat. He went over that with us and had a notarized bill of sale ready so that we would have no problem getting the boat registered. The size is perfect for us. At 9 feet 6 inches it has great interior volume, listed at 6 feet 9 inches. I have observed on other inflatables that the interior volume is far less and the tubes stick way our beyond the transom of the boat. Also, with the nice wide beam of 5 feet 7 inches it is very stable. Having two locations for seat is really nice because the aft seat location provides a very comfortable seat and keeps the boat open for carrying stuff and passengers. The boat is rated for 1,058 pounds and 4 passengers which could easily fit in the boat with the seat in either position. I don’t think you could row with 4 passengers though. After standing in it while floating I am very glad we sent with the classic over the ultra light. I think the second floor is key. The overall construction of the hull seams very good. The welds all look nice and professionally done and the powder coated hull didn’t show any chips or inconsistent coating. The grey, rubber non-skip included on the hull floor is very comfortable under bare feet. The ORCA hypalon tubes are large, 17 inches in diameter, and appear to be very well constructed. There are three chambers in the tubes. They have held air very well even though the weather has had some extremes for this time of year with some low temperatures getting down into the high 30s and highs in the mid 80s. Only the port, rear chamber has felt soft but that hasn’t even gone to the point of requiring more air. there are three molded handles attached to the tubes, one in the front and two on the sides near the stern. The ones near the stern are in great places where you can use them for dock lines or lifting/carrying the boat. The one in the front would be perfect for using with a set of transom wheels. There are also six fabric handles near the bow. They all seem to be very well adhered and do not show any indications that they will give under normal stress. There are also two D-rings adhered to the front of the tubes for attaching a bridle. The shape of the aluminum hull is perfect. The hull is deep near the bow but flattens out a bit near the stern. This keeps the boat dry while plowing through chop and waves but allows it to get on plane. A vinyl keel guard came installed on the hull that matches the grey fabric and is very well adhered to the hull. There is a fixed attachment point for a line near the bow of the hull that looks robust enough to tow with but I prefer to use a bridle. It does make a handy place to attached a dock line. There are also six lifting points attached to the hull. Two are located near the bow at the base of the anchor locker. Four are located at the stern with two points at the top of the transom and two at the base of the transom. They look strong and provide a good place for locking a cable to secure the boat when at a dock. We haven’t tried lifting the boat from these points yet but plan to pick up a harness and using these points to lift the boat onto the deck or to suspend the boat at night while on the hook or ball. These points also make great attachment points for a boarding ladder to assist in returning into the dingy after some snorkeling. The following items were included with the boat: oars; air pump; molded plastic rowing seat; repair kit; large piece of white hypalon for repairs; seat bag; dry bag, and; cover. The oars are light weight aluminum with plastic blades that can be taken off quickly for storage. The oar locks are great and there are Velcro straps for securing the oars in place. The molded plastic seat blows away any wooden, plastic or aluminum seat I have seen on any inflatable. It’s very strong and comfortable to sit on. When you add the padding from the seat bag you can’t beat this seat. The air pump is a high quality foot pump but I haven’t used it yet (see biggest annoyance below). The seat bag is the typical style with a large storage compartment under the seat and 3 smaller pockets on one side. It has drain holes and is well made with marine zippers, claps and grommets. We only tried to use the cover once but quickly gave up because the line to pull it tight is only rope and that made getting the bottom tight difficult. We will likely replace this line with shock cord to make using the cover easier. We have not had need to use the patch kit (and hopefully never will), but I don’t really understand why they included a large piece of white hypalon instead of the grey that matches the boat. We have not used the dry bag yet but probably should have (again, see biggest annoyance below). 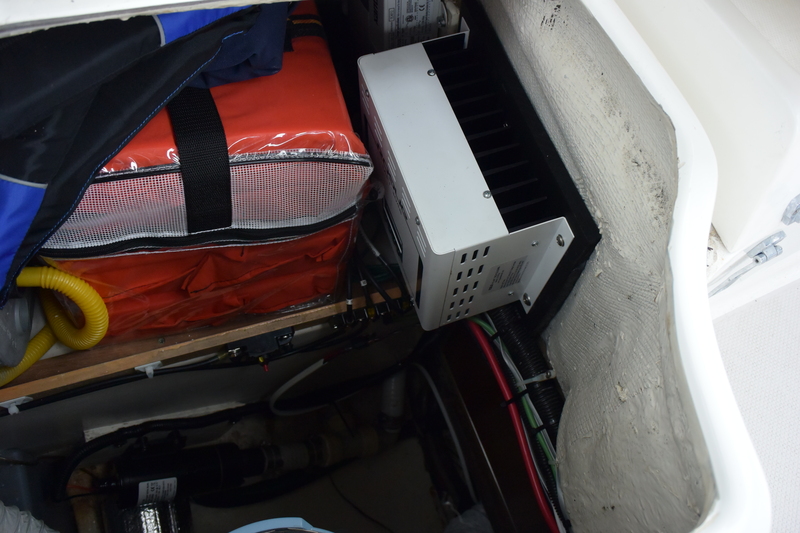 Between the anchor locker and under seat bag this boat has almost too much storage. We fit two PFDs in the storage bag with room to spare for our dingy boarding ladder and navigation light. The middle of the smaller pockets holds the repair kit and a small tool kit for engine repairs. The side pockets are mesh and we primarily use them as drink holders or for other small items. The anchor locker is large. We fit a 5-pound claw style anchor with 50 feet of rhode, a bridle, two 10-foot dock lines, a quart of 2-stroke oil, a quart of ethanol treatment, the air pump, a water bowl for Summer, a sponge and a regular size bath towel and still have room to spare. The opening area of the anchor locker is also very big which makes getting items in and out easy. Some of the other RIBs we looked at had very small opening into the anchor locker. It is also an extremely comfortable seat. We like to go out and just put around in the dingy. Sitting on the anchor locker while leaning back on the tubes is like sitting in a Lazyboy! It also makes a great step for getting in and out and Summer loves to put her front paws on it and get her head into the wind when my Bride isn’t sitting there. The anchor locker has a soft, rubber latch (nice touch Highfields! this could have been painful with a solid latch) that allows you to secure the locker closed with a small padlock. However, this anchor locker is also the focus of my biggest annoyance below. On top of that, the oars can be stored ready to deploy. Plus there are additional storage points down closer to where the hull meets the tubes. However you have to take the blades off of the oars to use these storage points. Those points have become very useful in holding a tiller extender for the motor and a small hand pump incase we ever take on some water. They also very smartly placed a Velcro loop for holding the bowline/bridle so it doesn’t accidently slip off from a wave hitting the bow. Again, well done Highfields. We have been keeping our 3-gallon gas tank in the stern, between the two transom supports. This works well but it does add a little too much weight to the rear of the boat. The anchor locker leaks! I had read online prior to buying the boat that the anchor locker rattled some but that seemed like an easy fix; just add some gasketing material along the edge so you don’t have metal on metal. I added the gasketing and that reduced the water but it didn’t stop it. I now think there may be water getting by the bolt holes for the hinges. It doesn’t appear that these are bedded. So my next attempt at fixing this annoyance is bed these bolts. 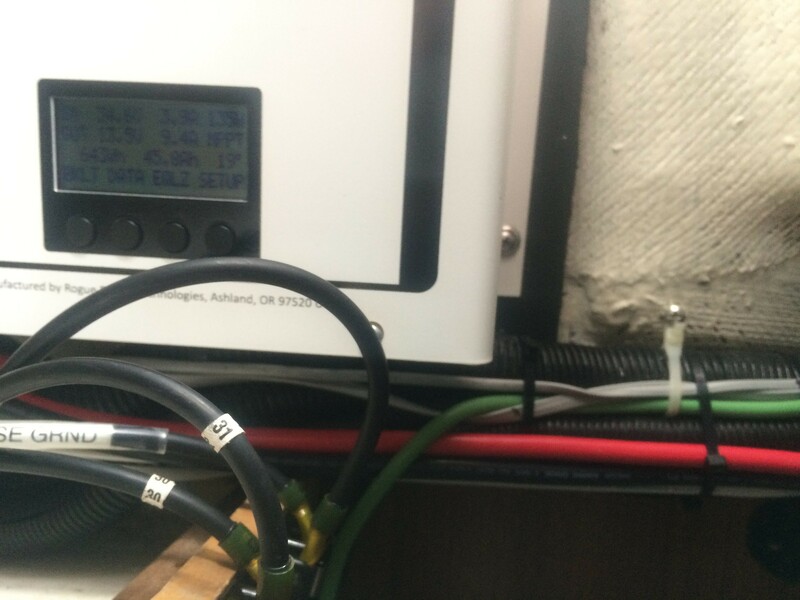 To compound the problem, the drain from the anchor locker into the small bilge is way upfront in the locker. I see why they did this, it prevents water from building up in the bilge and then filling the anchor locker. However this makes the water sit in the anchor locker and not drain at all. I may drill a couple more drain holes to change this set up. While Highfields had thought out a lot of aspects of this boat, one they may have seemed to overlook is registration plates. We prefer to use a plastic registration plate as opposed to painting the registration numbers directly onto the inflatable. We think this is a cleaner look most of the time and it allows you to completely remove your numbers if you sell the boat so if the buyer doesn’t register the boat you don’t get in trouble. On this boat the only place to attach the plates is to the fabric handles. I don’t really like this because its not as clean looking as it could be and it leaves zip ties to pinch you when you sit on the tubes. I have rowed this boat in both the traditional rowing position (i.e. back to the bow, seat at the front position) and in a reversed position (i.e. back to the stern with the seat in the rear position). For an inflatable it tracks really well. Very impressive and with the light weight as it moves along very quickly. Most often I end up rowing up to and off of the beach while taking Summer to shore. 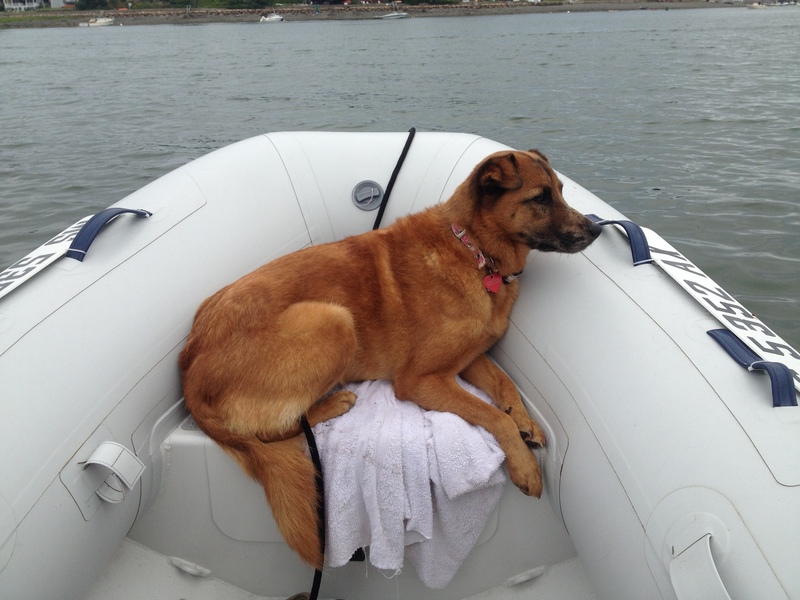 During typical use we have about 500-600 pounds of people, dog and gear in the boat. With this much weight we can’t get on plane with our 9.8 hp 2-stroke Nissan engine. We don’t really know if that is from the engine or weight and we plan to look at the engine in more detail before we leave and possibly change to a different pitched propeller. We do know with less weight this boat will get on plane and fly! As far as inflatables on plane go it is nice and stable but I would not consider taking a hard turn at full throttle. When not on plan the boat still move along very quickly. More importantly, due to the high bow the boat is very dry under normal conditions. Again, plenty of space for all to ride comfortably and we can carry some provisions and supplies without being overly cramped into the boat. We are extremely happy with our choice overall. This boat seems to be a great balance of cost with performance. 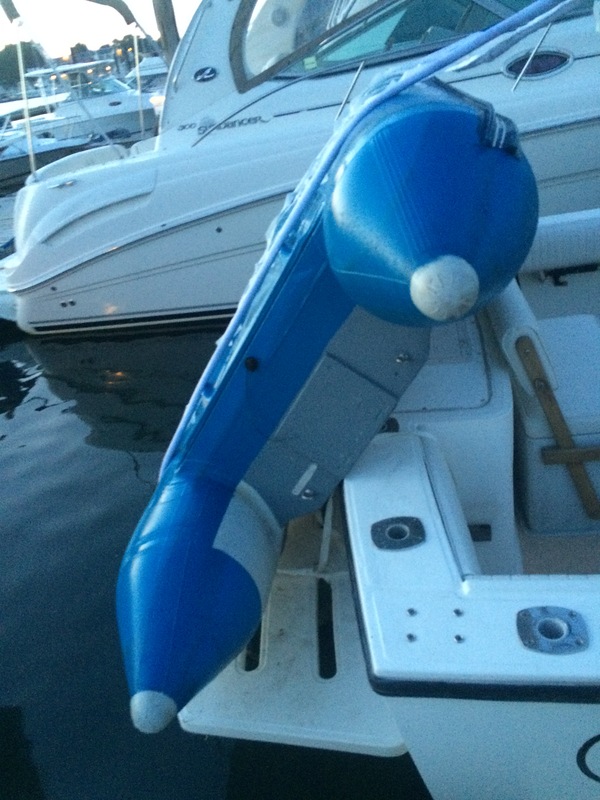 There are many aspects we like better than some of the more expensive inflatables such as the anchor locker access over that on the AB and the powder coated hull compared to the bare aluminum hull of the AB. Hopefully this boat will have great longevity and out lives it’s 10-year warranty. We were also very satisfied with Maritime Solutions/InflatableXperts. They were very pleasant to work with and I would not hesitate to buy from them again. In fact I saw a neat looking inflatable paddle board when we were picking up our boat that has me intrigued. Categories: Equipment/Products Reviews, Inflatable & Outboard, Upgrades & Repairs | Permalink.